Few authors of the Latin Middle Ages have been the subject of so much attention as Marsilius of Padua (c. 1275-1342/43). Known primarily for his Defensor pacis, Marsilius quickly garnered for himself the reputation of being a heretic as well as a schismatic. At the same time, however, it became evident that he was perhaps one of the brightest - if not most dangerous - thinkers of the fourteenth century. 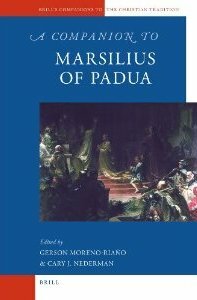 The political ideas and activities of Marsilius of Padua have engendered a substantial literature and numerous debates. The present volume serves as a much needed guide to the life and works of the Paduan thinker. It provides readers with a scholarly treatment and evaluation of the various interpretative schools and debates concerning Marsilus based on the latest relevant research. As such, the present volume will appeal to scholars interested in the importance and influence of one of the greatest authors of the European Middle Ages.